The Swedish helmet law was introduced from 1st January 2005. It applies only to children under 15 years old. Under Swedish law, no penalty is possible for children cycling alone who do not obey the law. However, parents cycling with unhelmeted children are liable to a fine of SEK500. In 2007 the law was extended to include Segway use, even on private land. There are no easily accessible sources of data about the extent of enforcement. Among under 10’s helmet use fell from its zenith of 54.8% in 1997 to 35.2% in 2004, the year before the helmet law was brought in. In 2005 wearing rates increased sharply to 64.8% and have remained about the same since. 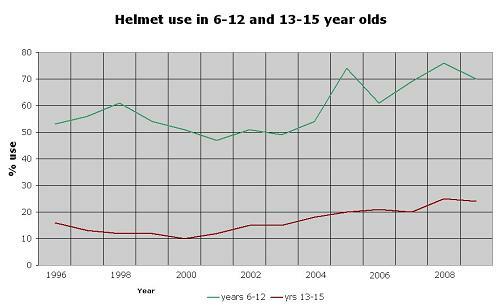 Helmet use in the 6-15 year category where counts are made outside schools, shows a more steady increase in helmet wearing with a slight up tick in 2005-6, probably as a result of the helmet law. Use reached a plateau between 1999 and 2004 in the low 30%’s and currently stands at 46.6%. Adults have a much lower wearing rate, which gradually increased from the early 90’s until 2005. It has remained around the low 20%’s since. This national data masks huge differences in wearing rates in different parts of Sweden and also in different age groups in the under 15’s. For example Lund famous for being cycle friendly and having lots of cyclists has a combined wearing rate of 15.1% (count 6230), compared with 66.9% in Stockholm (count 5801). There are large differences within this range in other towns and cities. Counts among children are rather small so the differences between places cannot be accurately determined, but vary from 6.5% in Västervik to 84.4% in Sundsvall (6-15 yrs). There is a big difference in wearing rates between 6-13 year olds and 13-15 year olds counted at school gates. The graph above shows a persistent difference between older and younger children’s wearing rates of 40-45% since data has been collected. In 2009 70% of 6-12 year olds wore helmets while 24% of 13-15’s did. It is impossible to detect any obvious effect of the u15 helmet law (2005) in the older age group, but it does seem to have temporarily at least increased wearing in the 6-12 years group. This might be evidence that the law has not been much enforced. VTI collects wearing data and Trafikanalys publishes road traffic casualty data (Trafikanalys), but there has been no audit of the law's effect on cycling casualties. No studies performed. The increase in the proportion of children wearing helmets has coincided with a fall in counts of 6-15 year olds cycling to school as shown below. It is unknown if the two are causally related. Larsson J, 2009. 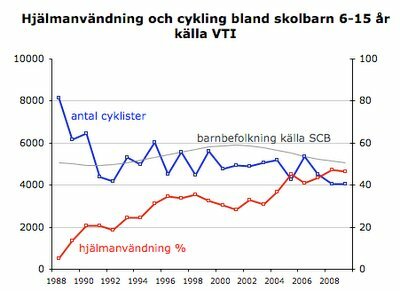 Cykelshj�lmsanv�ndning i Sverige 1988 - 2009. VTI 2009/0251-22. Nol�n S, Ekman R, Lindqvist K, 2005. 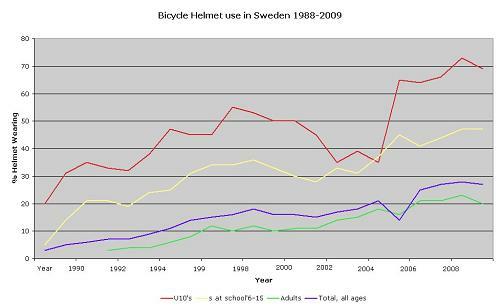 Bicycle helmet use in Sweden during the 1990s and in the future. Health Promotion International 2005 20(1):33-40.